While it hasn’t quite achieved the will-he-won’t-he twists of 2017's great NeyWatch, the Jay Cutler-Miami situation has had an unusual number of twists for a flirtation involving a 34-year-old replacement quarterback. Comcast Sports Net Chicago had Cutler signing a one-year, $13 million contract Friday to fill in for the injured Ryan Tannehill. That now appears to have been incorrect: Dolphins head coach Adam Gase shot down that talk, describing reports of Cutler’s imminent signing as “premature” and said that, while Cutler did express interest in potentially joining the Dolphins, the talks were preliminary. “When I get there, I will be able to tell you, but I don’t think it’s close to anything,” Gase said. “Like I said, I’ve had one conversation with [Cutler]. That’s where we’re at. 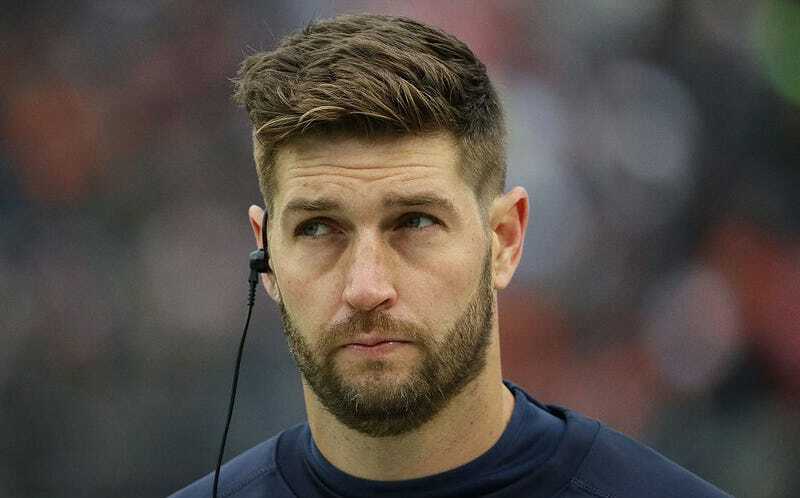 Jay Cutler is leaning toward staying in broadcasting and not joining the Miami Dolphins, sources close to the situation told ESPN on Saturday. Although Cutler became intrigued by the possibility of reuniting with Dolphins coach Adam Gase in the immediate wake of Ryan Tannehill’s knee injury, his continued contemplation is swaying him back in the direction of staying retired, sources told ESPN. Cutler and Gase were both part of the Bears organization in 2015, when Cutler had a productive season and a career-best 92.3 passer rating on an otherwise lousy Bears team. But Cutler’s 2016 season was poor, and broadcasting is a sweet deal, and he’s got a trio of children at home to not vaccinate. Tough choice!